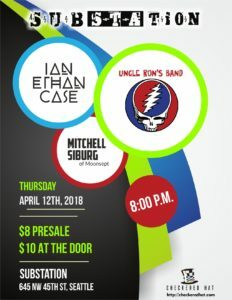 On Thursday, April 12th, Substation will be hosting a night of mind-expanding psychedelic music featuring three incredible acts. Substation is Seattle’s premiere underground music venue, located at 645 NW 45th Street. Don’t miss out on this opportunity to see these three wild acts all on one stage. Presale tickets are only $8, available through Brown Paper Tickets. Apodment “podners” will receive a $2 discount at the door upon showing their key fob.